As well featuring stunning estuary views and picturesque street scenes, Fowey has also reimagined itself into a foodie haven more recently. The town is filled with a fantastic selection of cafés, restaurants, and pubs offering delicious food all year round. Situated on the waterfront, this trendy bar and restaurant serves fresh local seafood, meaty burgers and award-winning ales. It’s a great place to enjoy a tasty lunch and refreshing drink, after a morning exploring Fowey’s winding streets and coastal walks. The Dwelling House is the perfect rest stop after a day exploring the rolling countryside around Fowey. Situated in a former merchant’s house, this charming tea room serves hearty lunches, delicious homemade cakes, and tasty cream teas, which include freshly baked scones and unlimited amounts of clotted cream. Famous for its ‘Fat Buoy’ breakfast, The Lifebuoy Café has been serving homemade cakes, delicious breakfasts, and hearty lunches since 2010. 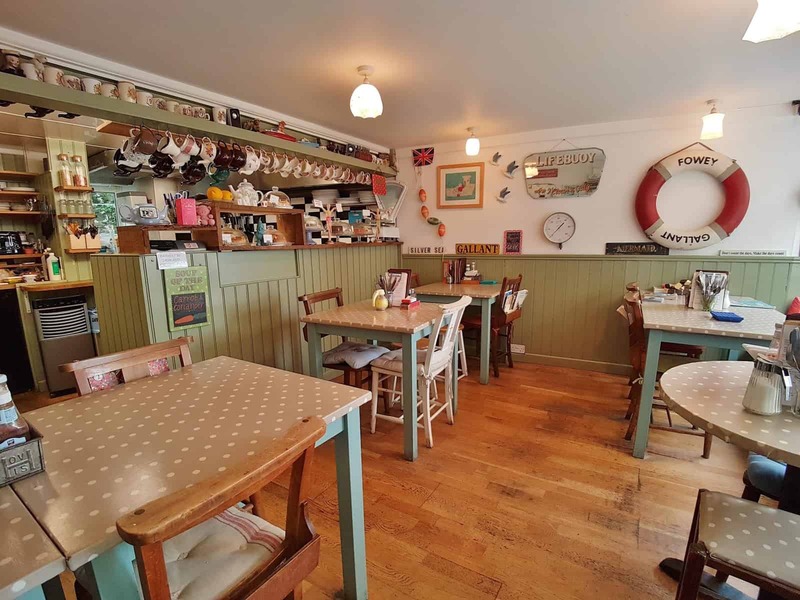 The cosy café is renowned for its friendly atmosphere and is well worth a visit if you’re in Fowey. Pintxo brings a taste of Spain to Cornwall. 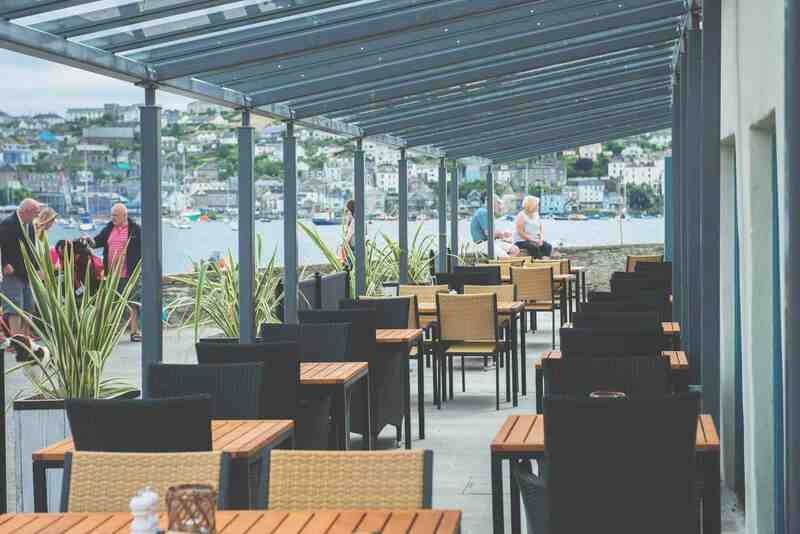 The relaxed, small tapas and sherry bar is tucked away on Fowey’s esplanade, and is a great place to spend time with friends, sampling the best food, sherries, and wines from all over Spain. Located on the town’s main street, Fowey’s popular bistro has been serving up delicious food since 1987. Using local ingredients, Sam’s specialises in classic seafood dishes, yummy burgers, and tasty steaks. Serving homemade cakes, hearty breakfasts, and tasty lunches, Pinky Murphy’s is located towards the end of Fowey’s main street. The quirky café is renowned around the town for its welcoming hosts and famous ‘Pinky Platters’. Find out more about Pinky Murphy’s here. The Old Quay House Hotel, Fowey, Cornwall. 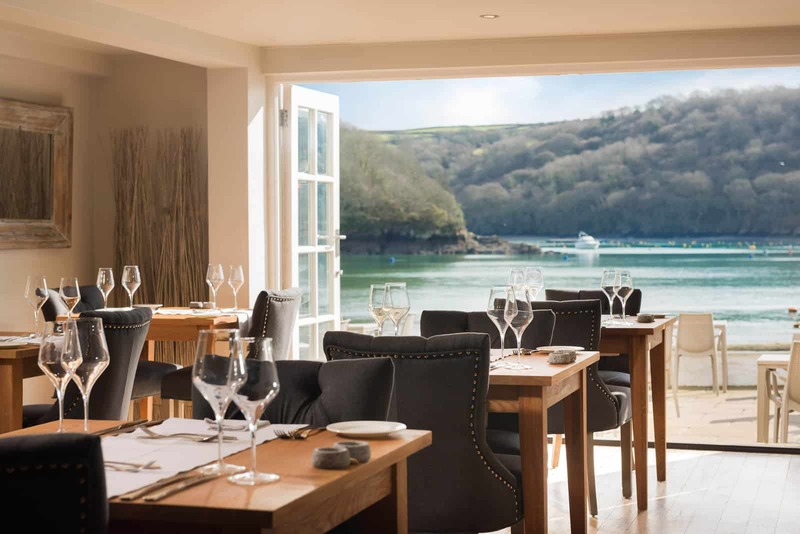 Our fantastic fine-dining restaurant boasts uninterrupted views of the magnificent Fowey estuary. Head chef, Richard Massey, serves exquisite food, influenced by the local seasonal produce available to him in Cornwall. The restaurant leads out to our spacious terrace on the water’s edge. On a sunny day it’s the perfect spot to enjoy an afternoon tea, pre-dinner aperitif, or a long, lazy lunch whilst watching the bob up and down on the river. The Old Quay House is offering a special three course Mother’s Day lunch on 31st March, with a complimentary glass of bubbles for mums. Call 01726 8333302 to book or for more details.